Historical advertisements for San Francisco's cab industry offer glimpses of the changing city. Gold Rush San Francisco was a city of mad extravagances, fueled by that great disruptor, gold. Miners returning from the diggings with pockets full of gold dust and nuggets descended on the city looking for a good time. For many, this meant picking up some liquor, prostitutes, and hangers-on in the Barbary Coast, then stumbling over to the Plaza (today’s Portsmouth Square) for a hack, which they treated as a mobile party-wagon, riding around the town for hours, or taking excursions to the Mission, Meigg’s Wharf, or the Ocean Beach, stopping for drinks at the numerous watering holes along the way. Most of the hack drivers of the day were independents—owner/operators of a single carriage—like John Glover, who ran the above advertisement in the Daily Alta California for a week in November, 1855. Glover seems to have been in a running competition to have the finest equipage in the city; the Alta reported that this carriage, built in Boston and shipped to California by sea, had cost him $5000, which would have been a preposterous sum in 1855—anywhere but in San Francisco, that is. As Glover’s ad indicates, he spent much of his time on the Plaza, waiting for business. 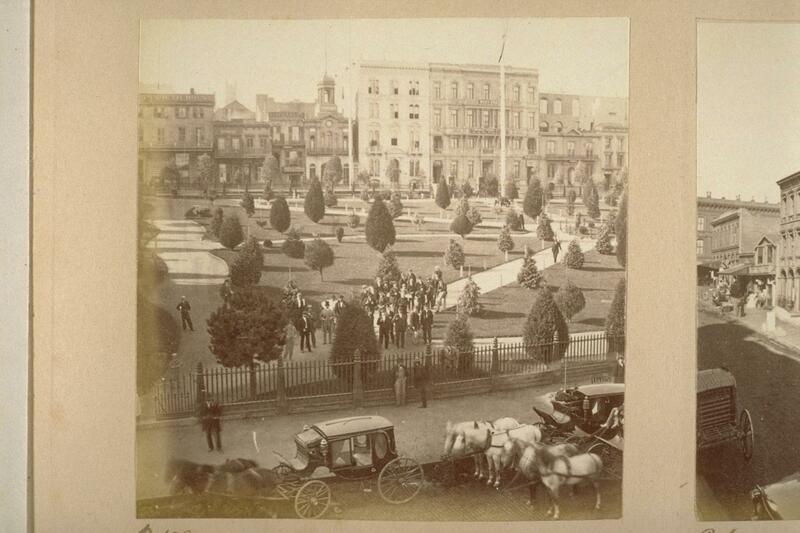 Just such an elegant carriage can be seen in the Plaza hack stand in an 1860s photograph by Eadweard Muybridge. Advertisement for Tomkinson's livery stable, c. 1880. Courtesy of the California History Room, California State Library, Sacramento, California. The livery stable was an essential feature of any city in the horse-drawn era. If you owned your own horse and carriage, this was where you boarded and stored them; if, like most people, you had neither, this was where you rented or hired them when needed. Liveries were also the mainstay of the hack industry. Independents like John Glover stored or rented their hacks and horses at livery stables, and some stables, like Tomkinson’s, kept their own small fleets of hired carriages and drivers. Disruptive technology transformed San Francisco’s cab industry – in the 1870s. San Francisco was one of the first cities anywhere to see dispatch-oriented carriage companies, the precursors to the modern full-service cab fleet. 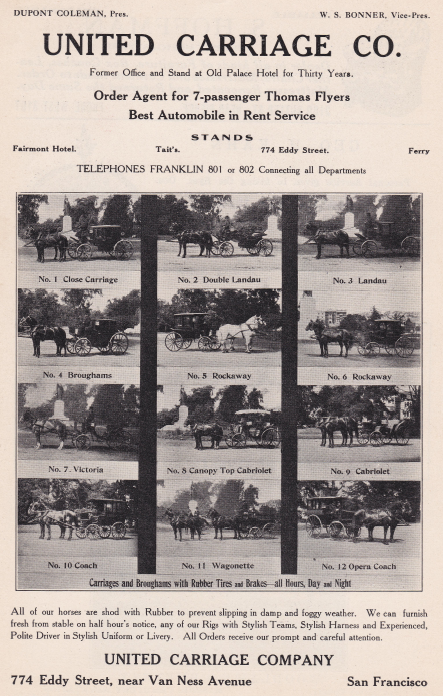 Beginning in 1877, cabs of the United Carriage Company could be ordered from company stands—first by home telegraph, and soon after, by telephone. Visitors from Eastern cities wrote admiringly of the convenience: "When shall we have a similar enterprise in New-York?" 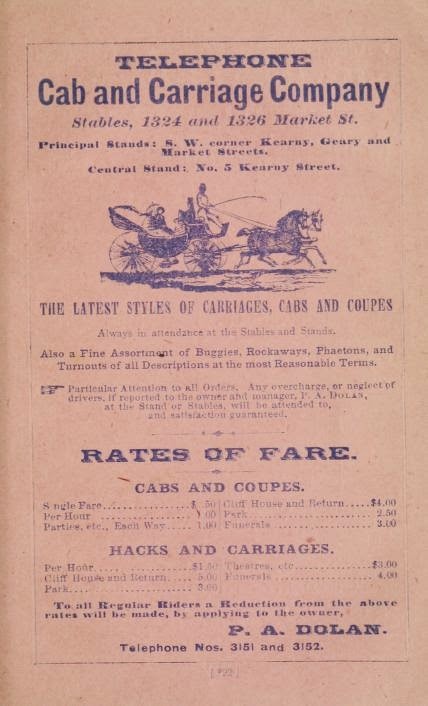 The UCC spawned a group of imitators with similar names, such as the Pacific Carriage Company, and the City Cab and Carriage Company. The small, short-lived Telephone Cab and Carriage Company was ingeniously named after the radical new cutting edge tech of the day. Perhaps catering to tourists, newcomers, or anyone who couldn’t quite remember the name of that-big-cab-company-you-call-by-telephone, the intent was not unlike the "AAA Yellow Airport VIP Taxi" companies you might see today. The TCCC's owner, P.A. Dolan, was an Irish immigrant who showed a preference for hiring brothers and cousins, also named Dolan. The Dolans had an unfortunate tendency to get into shootouts, at least one of which was linked to Dolan's involvement with Democratic Party machine politics of the day; the Mayor had the power to dole out favourable cabstand locations as rewards for political support, and contests between mayoral candidates could take the form of proxy warfare between rival hack teams on the city streets. For the story of another carriage company from the era, see The Short, Contentious History of the Gurney Cab Company in San Francisco. 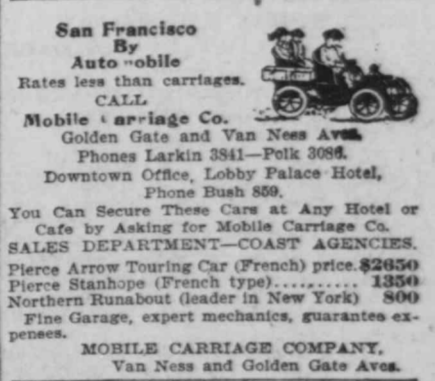 Advertisement for the Mobile Carriage Company, San Francisco Call, 1904. The first automobile dealers in San Francisco had a problem—most people found their product unfamiliar and frightening. To get those vehicles off the lot, and accustom the public to riding in them, the “motor livery” was born. Vehicles were rented out by the trip or by the hour, with a chauffeur whose job was not only to operate the machine, but to fix it when it broke down. People were both fascinated and terrified by the early automobile. No clip-clop of horse hooves warned pedestrians of their approach as they zipped down city streets at inhuman speeds of twenty, even thirty miles an hour. Passengers, fired up by watching daredevil auto racers out at the Ingleside track (such as cigar-chomping Barney Oldfield), would urge their chauffeurs to speed on the way back into the city, resulting in spectacular and often gory collisions with streetcars, carriages, and hapless pedestrians. This 1904 Mobile Carriage Company ad shows a chauffeur and passengers in what looks like a Pierce Arrow. These "Brass Era" motorcars were not ready to replace the horse and carriage. Drivers and passengers were thrown together on open, windblown seats, similarly bundled up in goggles, scarves, and gloves. The sedate carriage, with a closed compartment which preserved the social distinction between driver and passenger, remained the more respectable way to get around town. Though motor liveries may have started out at “rates less than carriages,” they soon became much more expensive. The city responded by fixing the legal rates of hire, and requiring licenses for both vehicles and their drivers. 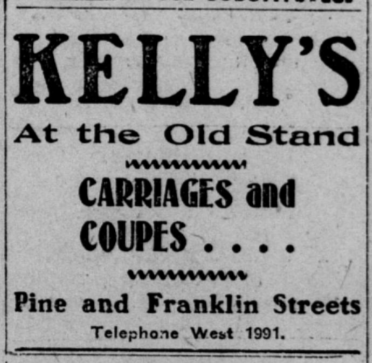 Advertisement for Kelly's Stables, San Francisco Call, May 15, 1906. The Great Earthquake and Fire was, among other things, a transportation nightmare. As tens of thousands tried to flee the city, some of the more entrepreneurial hackmen responded with an early instance of “surge pricing,” charging up to $100 per seat for rides from the Palace Hotel to the ferries. 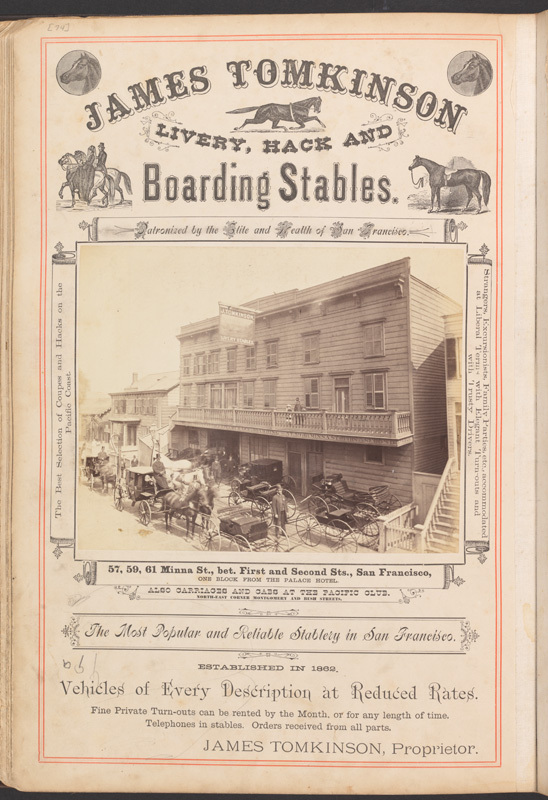 Not all of the city’s hackdrivers tried to cash in on the disaster; the photographic record shows hacks (often sans horse) being used to evacuate household belongings from a residential neighborhood; to form an impromptu barrier on Van Ness; and as temporary housing in a Golden Gate Park refugee camp. Kelly’s stables, one of the old premier livery stables of the city, had the good fortune to be located just outside the fire line. Less than a month after the devastation, as the city began to rebuild, Kelly’s reassured customers that they were still available “at the old stand,” on Pine near Franklin. Advertisement for United Carriage Company, San Francisco Blue Book, 1907. The old meets the new in this 1907 United Carriage Company advertisement. According to one story, the UCC had lost all but five carriages in the 1906 fire; by 1907, the grand old carriage company was rebuilding its fleet, with a new headquarters on Eddy, just off the new auto row along Van Ness. The photos demonstrating the UCC’s catalog of carriages were taken at the foot of the Panhandle, a location charged with significance. The 1903 McKinley Monument, seen in the background, would have reminded San Franciscans of happier, pre-quake days; just across the street stood the Coliseum exhibition hall, which in 1907 hosted San Francisco’s first major automobile show (and yes, the DMV now stands on the Coliseum's former site). Now with “Rubber Tires and Brakes,” the horse-drawn carriage was still evolving, even in its final years as a significant mode of transportation. As the ad reveals, the UCC had already begun a switch to the motorcar, offering the popular Thomas Flyers for hire alongside its carriages. The bold front did not save the distinguished old hack company. The United Carriage Company went bankrupt, and its entire stock (including 70 carriages, 95 horses, and 2 automobiles) was auctioned off by creditors in 1909. That same year, the first taxicabs hit the streets of San Francisco. This is an ongoing project -- any and all comments, criticisms, corrections, questions, or contributions are welcome! Too bad United Carriage Company didn't make it through the transition to automobiles. It would be nice to trace a direct line, with a carriage operator becoming a taxicab operator. I imagine that many of the first cab drivers in automobiles were former horse cab drivers. Or were the taxicab drivers newcomers with different skills who just replaced the horse cab drivers? Hi Charles, let me say first that it was reading your research that first gave me idea of learning about this history. So thank you. The UCC didn't make it, but at least two of the mid-sized livery stables did make the transition. One of these will be mentioned in part two. There were definitely drivers who made the switch as well. I think a fair number of independents did. By the teens, when motor cars had come down in price and were more reliable, there must have been a point when replacing your old carriage with a new one, or with an automobile, was an obvious choice. William Duggan was a hackdriver who switched into the taxi and limo business. Like many hackdrivers he was involved in the funeral trade. The Duggan's funeral homes still carry his name.